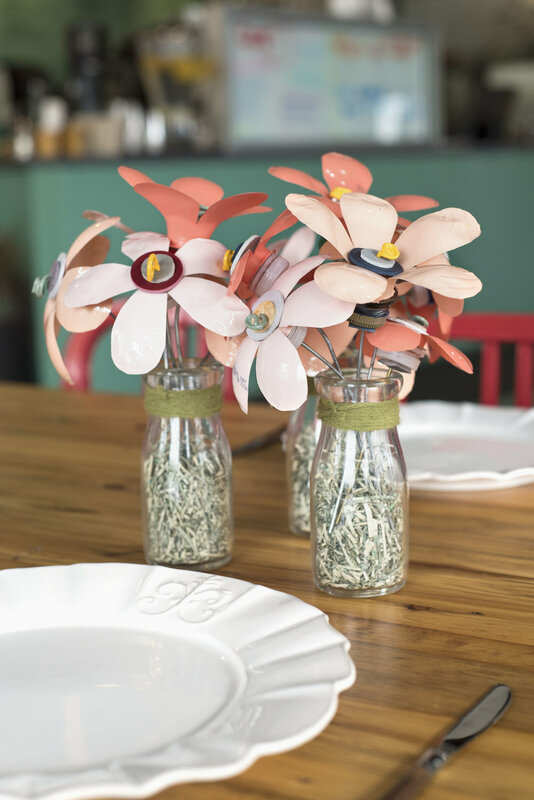 Bottle Blossoms are the perfect option for your wedding or event. 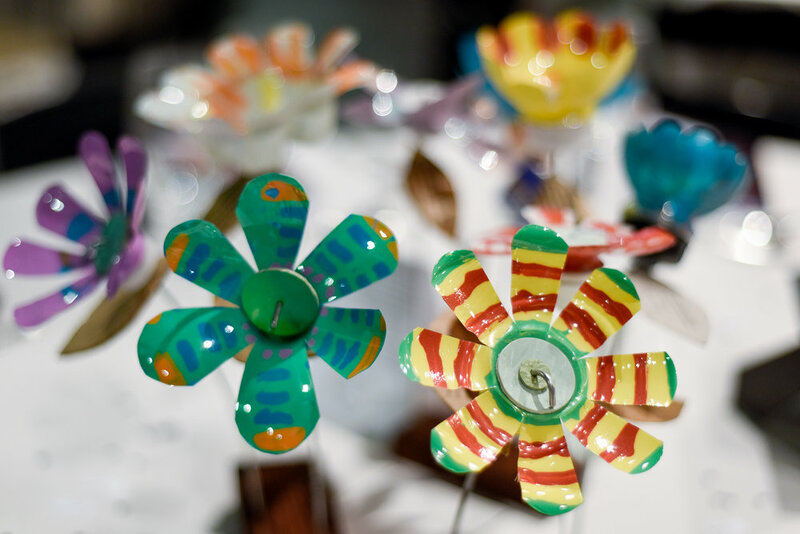 Beautiful, sustainable, and giftable, each stem is handcrafted with care to bring beauty and life to vinyl flooring samples, wire hangers, and plastic bottles. They are a manifestation of the belief that beauty really does lie in everything around us if we are just able to suspend our biases and look at it with fresh eyes. Available in the 15 classic & elegant or bold & bright colors shown below as well as the special edition "Artist Series" from Brian at Recovery Resources, the signature product from Upcycle Parts Shop are perfect for showers and weddings, annual meetings, or for some pops of color and creativity in your home, office, or hotel. They make wonderful favors, blend nicely with eucalyptus and other live and dried greens, and can even be made in custom colors for an additional fee. You can put paper "leaves" with names and table assignments on them and use them as a favor as well as a stunning visual at the entrance of your event. Maybe you have a long garland of flowers woven together with greens on a long barnyard table. We think the opportunities are endless and look forward to seeing how you will incorporate them into your next big day! 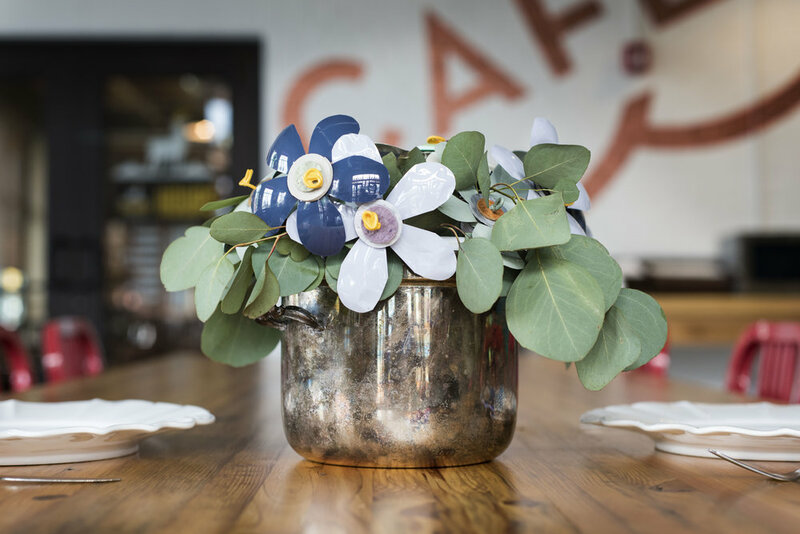 In addition to the wood block and milk bottle offerings, we are available for hire to design and execute custom centerpieces to bring your vision to life. See the custom designs pricing below and don't hesitate to email or call to learn more. 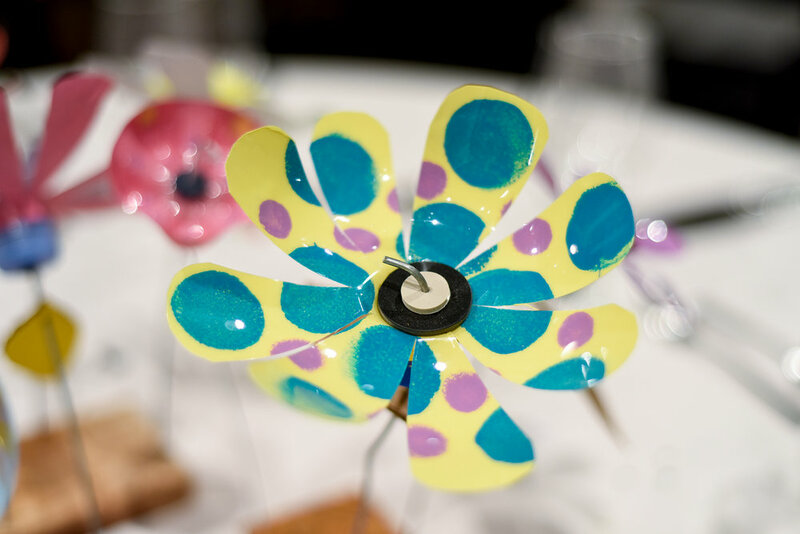 The process to transform plastic bottles into our signature bottle blossom flowers takes 19 steps per stem. We didn’t set out to make it long, but as artists, we know beauty and craftsmanship when we see it, and we strive for it in our own products. Beginning in 2013 we started seeking help with the bottle cutting process from our partners at Recovery Resources. This non-profit social service organization has an in-house social enterprise that employs program participants to build custom wood frames and the small team of detail-oriented production workers started stepping up our process in big ways. What started with cutting bottles led to training and creative takeover of the entire flower assembly process. We’ve been blown away. Brian, in particular, is a resident artist in what we affectionately call ‘the flower shop’. If you have seen bottle blossoms with intricate polka dot and striped designs, Brian is behind it. He lights up when he shows his works in progress and new design techniques and it feels like a magic behind-the-scenes tour of every time we come by. His special designs are always available and can be incorporated into your event with custom colors with enough lead time and for an additional fee. We call them our partners. What we mean is they are our team, the Recovery Resources social enterprise department. Bottle blossoms mean something powerful to all of us. If you can find beauty in something as common as a plastic bottle, where else can you find it around you? Value is everywhere. Our work is to look for it, uncover it, transform it, and share it. 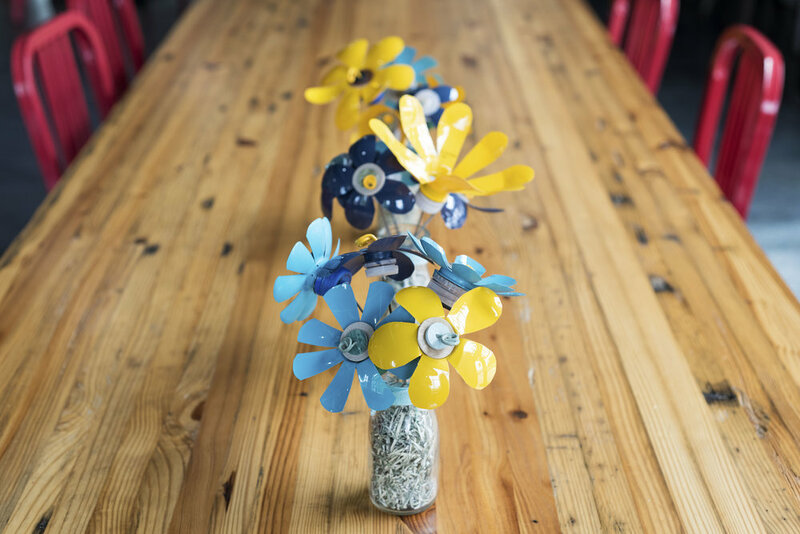 Bottle blossoms are a great way to do this, and your support goes to two organizations, and the artists behind them. Less waste, more art. Especially the kind that makes you feel awesome, will last a long, long time, and costs only $5 a piece. Want to learn more about Recovery Resources and the amazing work they do in Northeast Ohio? Head over to their website after you're done checking out pricing and some photos of Bottle Blossoms in the wild. Email or call us at hello@upcyclepartsshop.org or 216-361-9933 to book your event or find out more.